Mrs. Robb’s 1953-1954 class at Pennington School. MODERN ADDRESS Near the Lyle Swanson residence today (In 1898 was located about 3 1/2 miles from the Afton and Cottage Grove villages). The district was formed from districts 23 and 45. Pennington school was the 11th school of the Afton village schools. The land for the school was sold by Charles and Mary Pennington, who owned an 80-acre farm nearby, and also ran the Afton hotel. Most notable memories from alumni are when the water was hauled from the neighbors, little bits of salt was put in it so they could keep trekking back (since the kids got more thirsty). 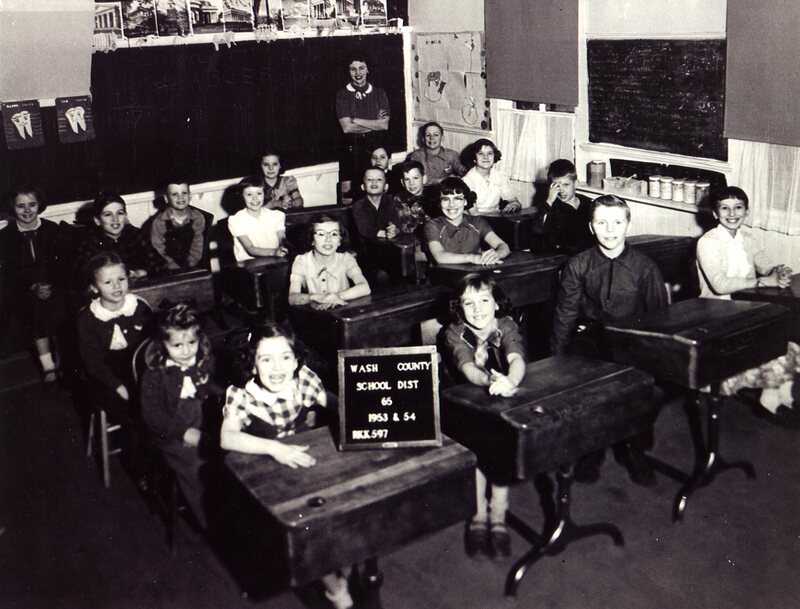 In 1945, new single unit desks were used. Up until then, the desks were of the ‘old style’. Enrollment in 1914: 21 students. 1939-40: Lois FoulisterOther teachers: (before 1898): Jennie Davies, Ema Arney, Mary Eckstie?, R.E. Olmstead, Ellen Roe. (after 1898): Rose Ourada Hendrickson, Emma Esty (40s and 50s), Babbit Robb (50s), Mrs. Robb (ca. 1953-54), Mehetable Bovenson, Mrs. Casey, Miss Carlisle.